This charming town home is quietly tucked away in Sunnyside, just blocks from Downtown. Perfect location for the Urban Professional, walk to work, LRT, groceries or the boutique shops & restaurant of Kensington. Extremely bright End Unit, surrounded by windows & skylight in staircase. The main floor features an open plan, oak HWD floors, cozy fireplace in living room, large dining area, functional kitchen & half bath. Upstairs, is a huge Master with 13’ vaulted ceiling & dual closets. 2 more bdrms & full bath are also on upper level. 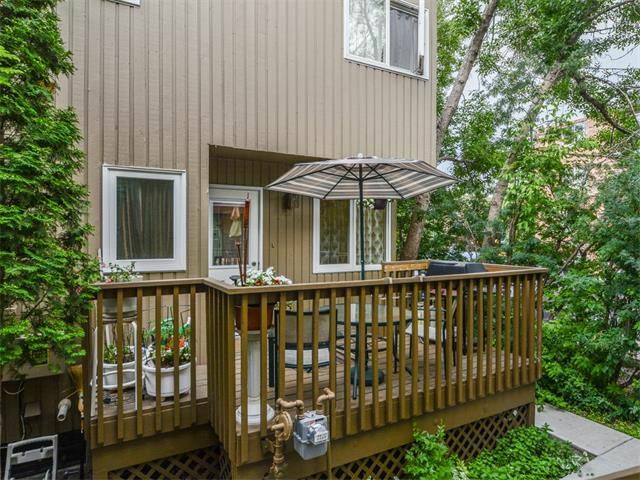 Beautiful south facing deck off the kitchen is perfect for BBQ’s. Basement is unspoiled & awaiting your personal touch. Tons of storage. Assigned parking stall with plug. Well maintained 6-unit complex, offers a healthy reserve fund, pet friendly & is 100% owner occupied. Freshly painted, HE furnace, almost all new windows & a new roof. Sunnyside is consistently ranked as one of Calgary’s Best Neighbourhoods by Avenue Magazine. Measurements are above grade, interior paint to paint.